The new Miga´s release is a compact proposal of Texas Sci-Fi project, a group based on experimentation, frequencies exploration, analogic errors and the synchronization between audio and video rhythms. For this complete release, [Miga31] "Figures / Frequencies", they has composed a collection of pieces created from pictoric works of minimalist artists from the twentieth century. [Miga_v15] Texas Sci-Fi "10 x10 x2 Cubes in blue" from Miga on Vimeo. Texas Sci-fi is formed at the very beginning of 2008 in Terrassa, a suburban town on the outskirts of Barcelona, Spain. The members of the band are three, Juanjo Fernández and Miki Martínez, two friends who shared an Indie pop project not long ago, together with Miki’s brother Rafa Martinez. They all work also in other parallel projects with which they have released some albums for several Spanish and international labels. With Texas Sci-fi they put together their best to create, this time, an audiovisual project full of strength, minimalism forcefulness and analogue experimentation. 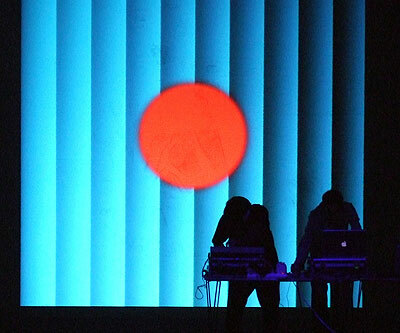 They use a long list of analogue synthesizers in their performances to doing so -Moog, Korg, Roland- combined with other vintage machinery that injects a direct input in the creation of amazing live visuals. As they use to say, they make “dance minimal sounds with experimental doses of impossible frequencies, white noise, clicks, cuts an bleeps”. A complex sound arisen from footswitches and other electronic stuff that gives shape to a perfect audiovisual synchronisation. The name of their first album is “Cold Landscapes”, a conceptual work for which they create original soundtracks for different cities, always trying to seek the parallelism with geometrical shapes. [Miga31] Texas Sci-fi "Figures / Frecuencies"
[Miga_v15] Texas Sci-fi "10x10x2 Cubes in blue"